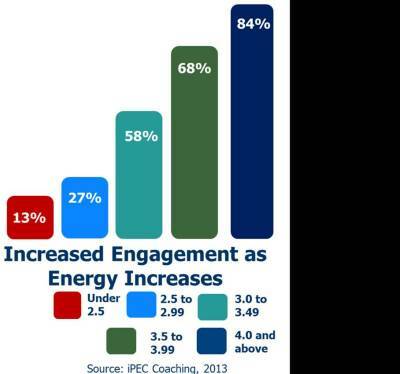 The Institute for Professional Excellence in Coaching (iPEC), a top rated coach training school and originator of the Core Energy Coaching™ process and Energy Leadership, teamed up with Zajonc Corporation, a leading expert of statistical research and evaluative analysis, to study the relationship between an individual's level of energy and 14 success factors. Surprisingly, of the 1,361 participants, those individuals with the highest levels of energy reported 7 times greater engagement and 4 times greater productivity! 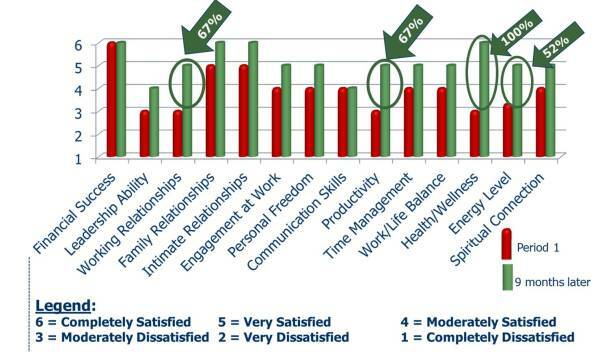 On average, using a 7 point scale, most individuals' energy was rated at 3.25. These 7 levels are not arithmetic but rather exponential (like the Richter scale) where a 4 is ten times greater. 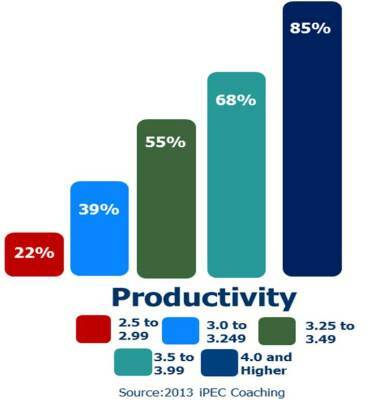 Individuals in the workplace with a 3.25 average are definitely disengaged, less productivity (again, see the chart above) than those operating at a 4 or 5, are less innovative and always looking to do less rather than more. They frequently experience significant stress, are more distracted from the task at hand and have a "victim" mentality. The first step is an online, self-assessment that takes about 25 minutes. It includes an assessment agaist 14 critical success factors. 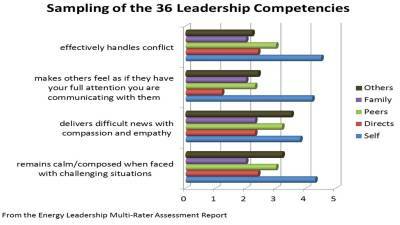 For greater, more focused feedback we also offer a multi-rater assessment that focuses on 36 core, leadership competencies and can include up to 30 raters. Both assessments offer detailed, personalized reports and can be used to document behavioral outcomes after coaching compared to before coaching. See sample report "Critical Success Factors" below. The graphic above illustrate an excerpt from the multi-rater assessment. Note how easily you can see where the leader's ("self") viewpoint differes significantly from others. This helps to drive the co-creation of the development plan. 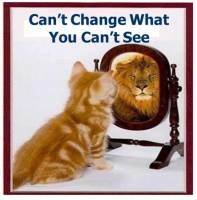 This tool is particular useful in situations where the person being coached is in denial as they do not see anything wrong with their "style" or interactions. Based upon the assessments and any other data input, we co-create a development plan that will dirve the Core Energy Coaching program. This plan targets specific competencies, key behaviors and specific goals to be accomplished. It is the "roadmap" for the program that is continual reviewed against progress made. This is one of the reports that is generated as a result of the Energy Leadership Index (ELI) Assessment. It helps identify targeted areas for improvement and is also used to compare "before - and - after" results. In this example you can see that productivity increased 67%​ and "wellness" improved 100%. This individual was a senior leader in a global business services firm and was coached for just 9 months. 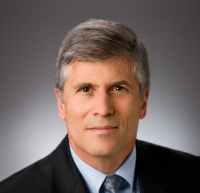 Victor “Vic” Bullara, Master Coach, brings to the company over 35 years’ experience in the human resources profession, including 19 years as a Western Regional Practice Leader for Ernst & Young, Development Dimensions and McBer (where he had the privilege of working with Dr. Daniel Goleman (the "EQ" guru). For 14 years, he was Chief HR Officer for two technology companies and director of HR for a $1 Billion engineering services firm. He has been coaching senior leaders since 2009. He is passionate about the neuroscience of leadership and succession planning. He is on the Board of Directors of a virtual reality content developer and is an Advisor to a business incubator. 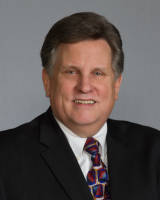 Kim Sawyer has over twenty years of diverse business experience; he has started businesses, led companies, and been involved in almost every aspect of a business enterprise. Kim founded, served for ten years as the C.E.O. of, and in 1998 profitably sold his company, Muscles for Hire, L.L.C., a commercial and residential specialty service provider. In 2000, Kim founded theWealthSource®, an executive and enterprise coaching firm. 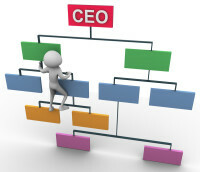 He is a Certified Executive Coach. Kim holds a BBA in Entrepreneurship from the University of Houston and an MS in Organizational Development from the University of Texas.